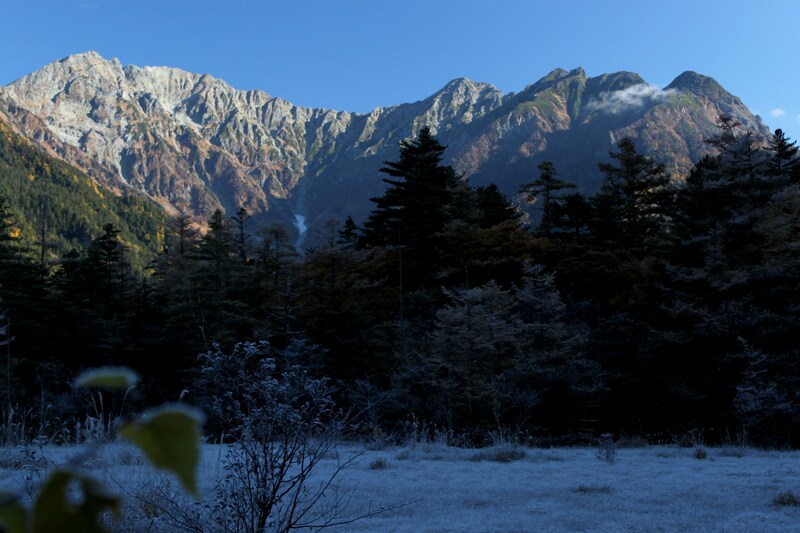 With the success of the first Kamikochi gathering, it came time to start thinking about another meeting of the mountaineering minds in Kamikochi. Miguel and I talked about possible dates, and with the feedback of other members of the Facebook community, we nailed down the weekend of the autumnal equinox as the official date. The rules were the same as last time: find your own way there and bring some food to share. This time around, instead of the grassy fields of Tokusawa, we set our sights on the forested flatlands of Konashi-daira, a short hop from the bus terminal. This would allow not only children to attend, but for other mountaineers to use our site as a base camp for the weekend. Miguel and Brant headed in early on Thursday to secure a site with a picnic table, as I caught the 6am train from Osaka on Friday morning. I made surprisingly good time, arriving at Kamikochi bus terminal in the late morning with some of the best September weather I’ve seen in the Alps. I immediately located Brant (and family) and Miguel, set up my modest camp, and met up with another member Dean, who had come with his wife and young child. We spent most of the day getting to know each other, with the kids chasing monkeys and the adults chasing mountain dreams. As the afternoon lost the battle with evening, Brant, Miguel, and I retreated back to camp, making a cosy fire and preparing a wonderful curry dinner. As we settled in around the fire, a familiar face strolled into camp. 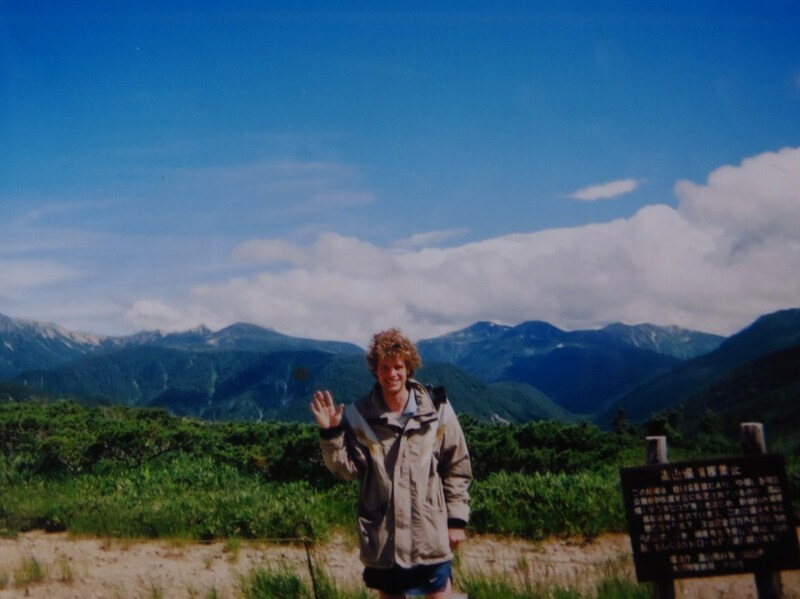 It was Michal, a friend from Osaka who had just come in from a long trip up the Yatsumine ridge on Tsurugi. Michal went right to work, honing his Czech-trained fire crafting skills, keeping the inferno blazing brilliantly the rest of the night. Sitting around the fire sharing stories made us all soon forget the tough effort it had taken to get there, with traffic jams, crowded transport, and noisy tourists. 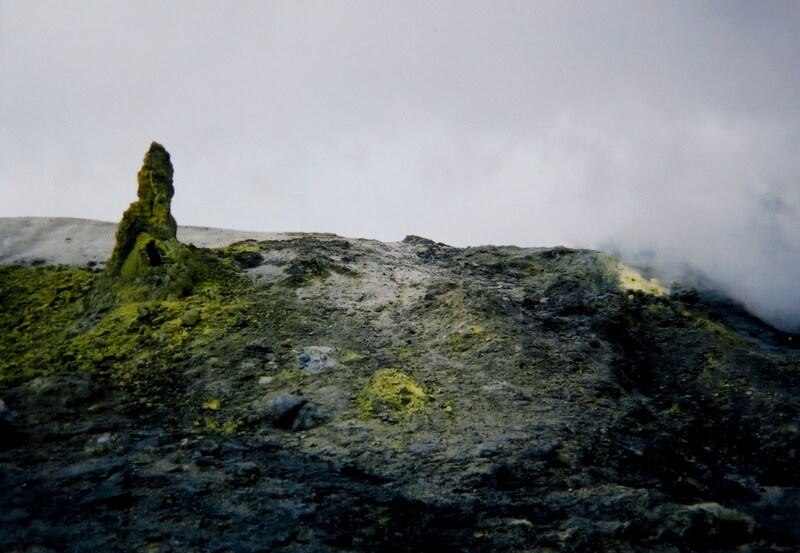 The next morning, after a fitful sleep, the first of the guests began arriving, Paul from Nagoya rolled into camp and set up shop next to me, showing off the wind-bent poles after his long summer trip in Iceland. We took over a sunny area near the river, leisurely making breakfast and coffee under the brilliant sun, before heading off to Myojin for an early afternoon stroll. Brant and Dean headed back with the kids, while Miguel, Paul and I explored the tranquil shores of the lake before looping back around towards Kappabashi. Just before reaching there, we ran into Kayo, an old student of mine who was visiting Kamikochi with a couple of her European friends. After catching up, the boys headed back towards camp, snacking on ice cream and ohagi before rolling into camp in mid-afternoon. By then, most of the members has started to file in as we all started introducing each other. I recognized Naresh immediately, while Kevin and I caught up briefly. Viviana, Aidan, David, Tomasu, Michael, Maya, Miguel, Michal, Kaoru, Paul and a host of others stared the preparations for dinner. In all the chaos I can’t remember exactly who was doing what, but I do remember it involved avocados, taco fillings, salad, tortilla chips, refried beans, and fresh tortillas toasted over the campfire. The great mexican mountain feast ensued, leaving a happily satisfied group of mountaineers. 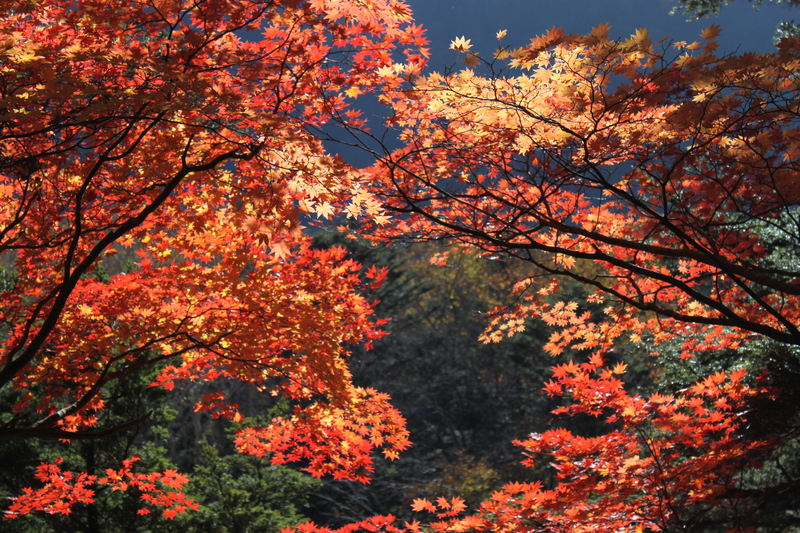 Tomomi showed up shortly before dark, having just come down off the Hotaka mountains. Ben and Romaric asked us all about our hiking plans the following day. In all our haste in preparing dinner we hadn’t really discussed our plans. Several ideas were tossed about before being finalized in the darkness surrounding the outskirts of the fire: looks like we had two different groups heading up to three different peaks. One was headed to Oku-hotaka, another to Yake and a third up to Tokugo pass. Aidan also planned a solo outing up to Oku-hotaka via the tough Dakesawa route, while Michal had his eye on the northern ridge of Mae-hotaka. In the midst of the reverie, Yamaboy made a surprise appearance, catching everyone off guard before retreating to the depths of the woods in search of Grace Yamaholic. 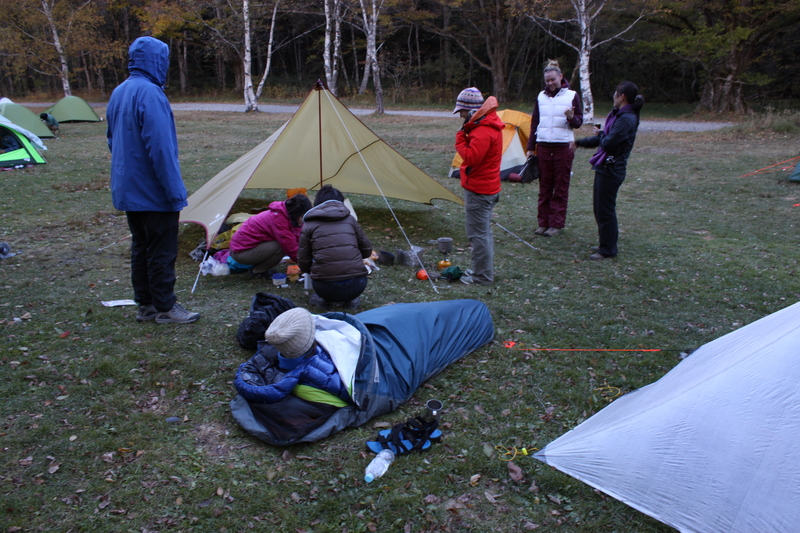 As the night drew on, our members gradually retreated to their tents. Most would be on the trail before dawn. Those of us heading up to Tokugo, on the other hand, had hoped for a more leisurely start. With the full moon flooding our camp with a strong white light, I suggested an evening hike to the pond at the bottom of Dakesawa, so Miguel, Naresh, Michael, Tomomi, Baku, and David (and maybe Tomasu?) strolled off into the dark. There may have been one or two other people lurking in the depths of the forest. The next morning, while most of the overachievers were on their way to the peaks, the late starters indulged in breakfast and a hot bath before hitting the trail around noon. We strolled through the forest, each at their own pace, before making our way up to Tokugo pass. It was an enjoyable afternoon break from the chaos of Kamikochi below. On the way back, I stopped by the restaurant at Konashi-daira to have a late lunch and ran into Kaoru and her boyfriend there. 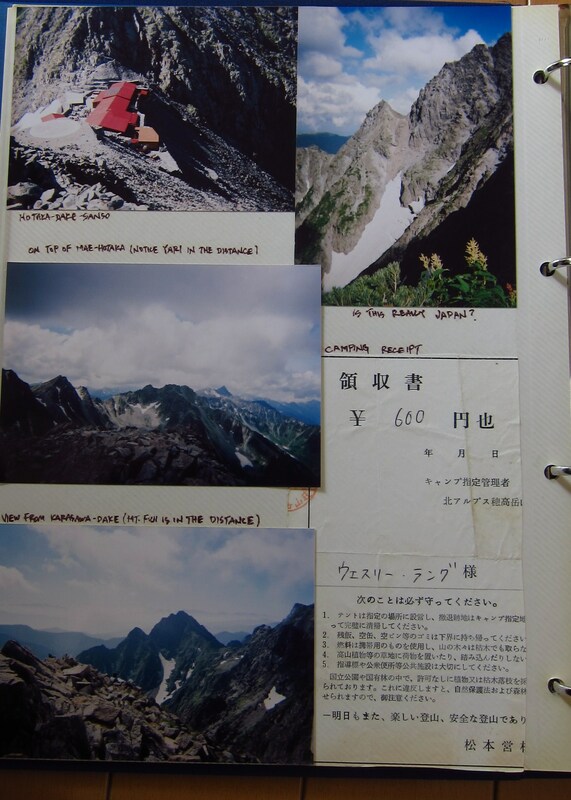 They had been up Yake-dake and showed me some photos. After filling my belly, it was time to start preparing for our Sunday evening meal. This time everyone was on their own for dinner, but we managed to have enough food and people involved to throw together yet another group dinner, which was most welcome. When planning a large gathering, it’s tough to find active participants that will pull their own weight, but everyone came together when it counted. We ate and chatted long into the evening. Paul told some rousing campfire stories while we all listened in with envy. Rie, Justin, and Andy also joined us for the Sunday evening festivities, after coming off Mt. Yari earlier in the day. Monday morning came and went, and none of us were too enthusiastic about packing up and heading back to reality. The weekend really flew by, and it was great to finally put some faces together with names. 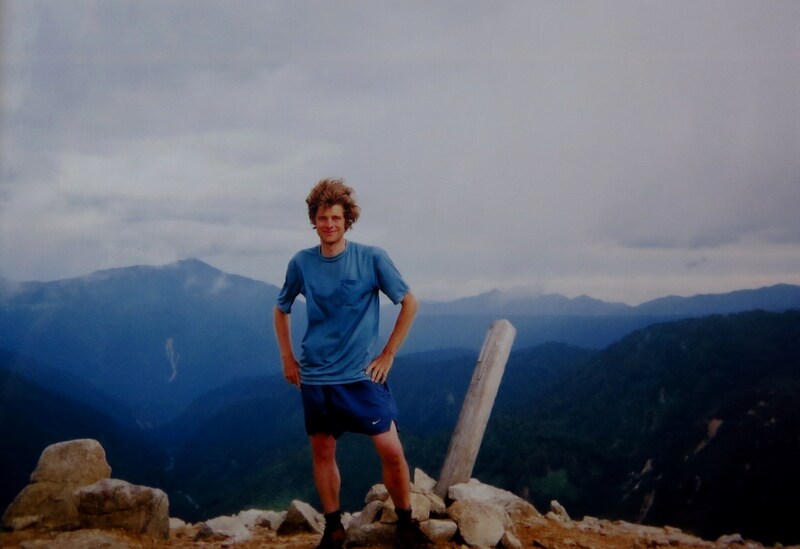 The foreign hiking community in Japan is strong and informative, with none of the competitive snobbishness you tend to find among adrenaline junkies in some of the other outdoor playgrounds worldwide. 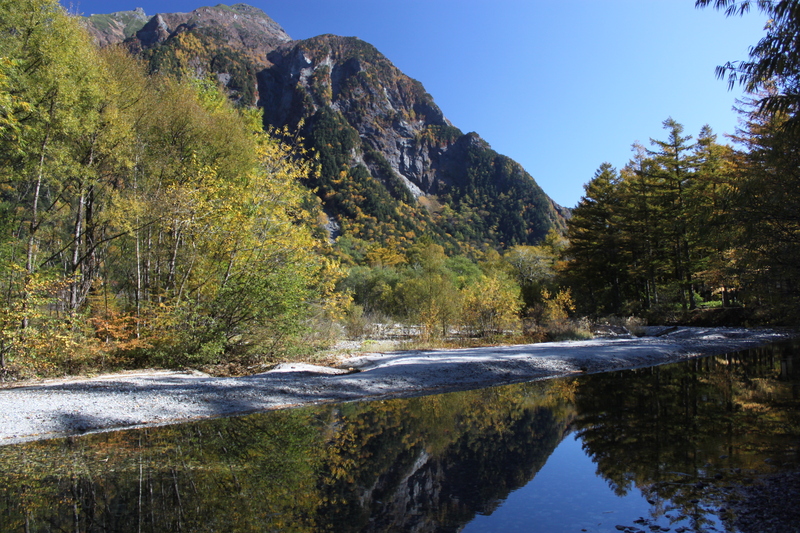 With two successful outdoor gatherings in Kamikochi, it will soon be time to start planning the third gathering for next summer, which will hopefully build upon the success of the other two. Sometime in mid-September, Miguel posted in the Facebook group about how wonderful it would be for “fans” of my other site to gather in the mountains and get to know each other. 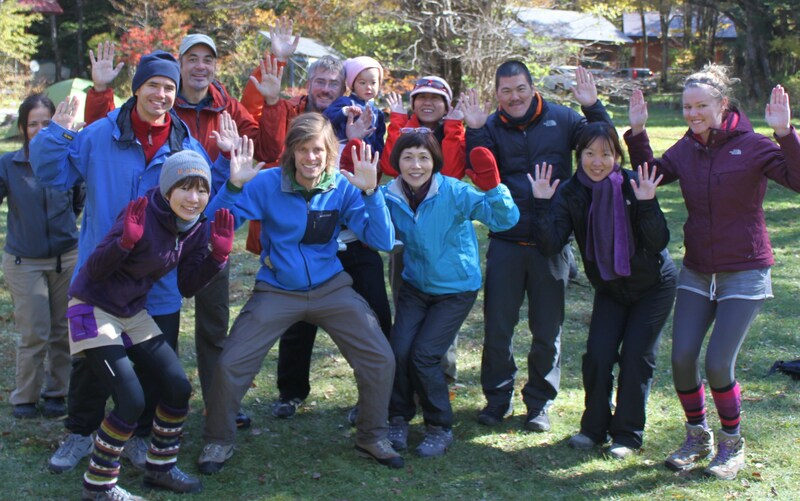 After some group feedback, we all settled in on a date and location: October 20 – 21 at Tokusawa campsite in Kamikochi. Grace and I met up at Toyama station at 9pm on Friday evening, where she drove her beat-up car to Sawando parking lot. Our plan was to catch a shuttle early the next morning to Kamikochi. We arrived shortly before midnight and set up camp behind the car. Grace opted for the cramped warmth of the vehicle, while I braved the subzero temperatures of the tent. The stars twinkled brilliantly in the crystal clear air, as arriving automobiles insured that my fits of sleep would be short-lived. After a quick canned coffee and some snacks, we boarded an early morning bus under the brilliant skies of a clear autumn Saturday. Since the weather was so incredible, we decided to alight at Taisho Pond for a longer but more scenic approach to Tokusawa campsite, the meeting point for the event. Mt. Yake glistened peacefully in the ripples of the calm waters, as photographers gathered by the shoreline to snap away at the mirror reflections. 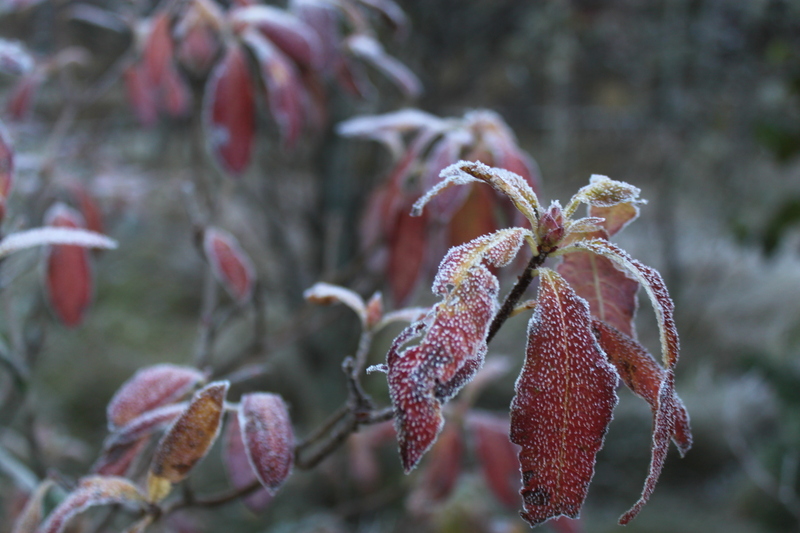 Our next stop in route to camp was Tashiro-ike and the frost covered grasslands just in front of the water source. The Hotaka mountains rose abruptly from the base of the valley as if pulled up by an invisible force from the stratosphere. Down at the pond, a few professional photographers positioned their box cameras to capture the early morning mist rising from the lakeside. 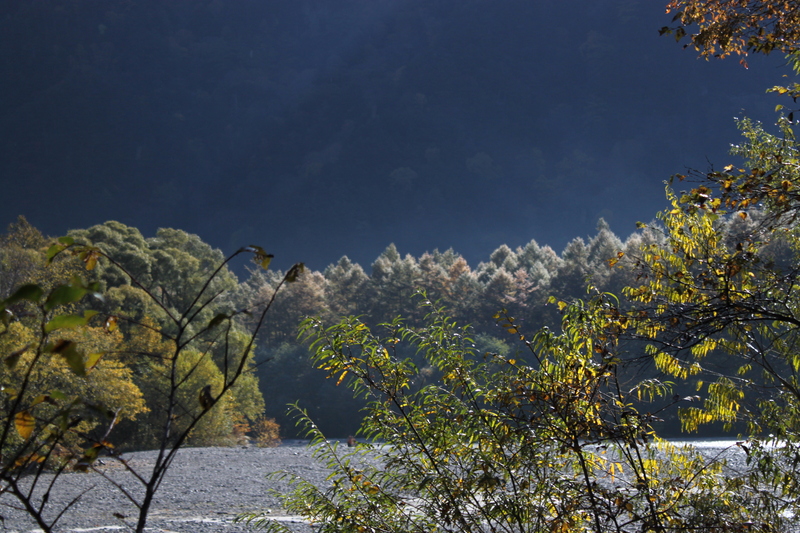 I’m sure some of these photos will make their way into magazines and books on Kamikochi in the future. After passing by the bus terminal, the next logical rest area was the small restaurant/shop at Konashidaira campsite, where my friend Shu works. Shu and I caught up while Grace and I ate a breakfast set. The three of us talked about the record number of tents set up in Karasawa a few weeks back. 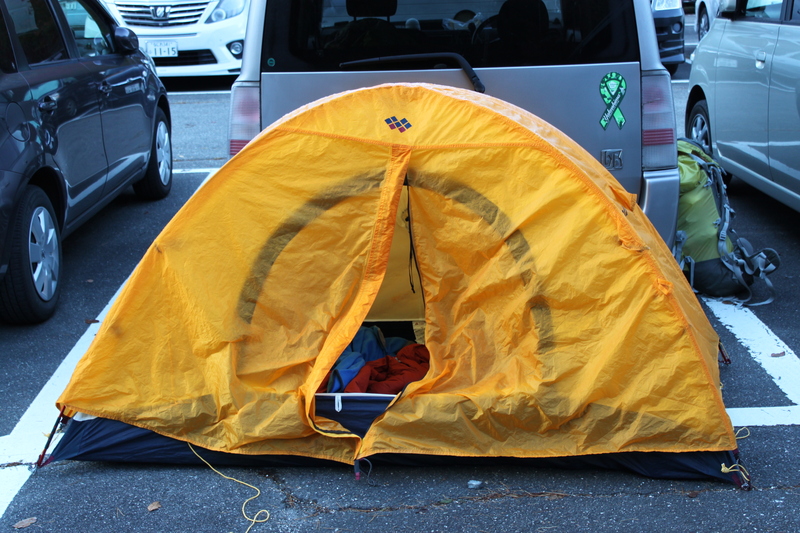 During the October 3-day weekend, no less than 1200 tents were pitched in the highlands. This mountain boom is really starting to get out of hand. Next up was the hut at Myojin-ike. Grace and I decided to save the pond for the return trip the next day, and simply sat enjoying the early morning sun. Grace was carrying enough gear to feed a large family, so our pace was slow but steady. Halfway along the flat walk between Myojin and our home for the night, we stopped along the shores of the Azusa river to rest. The lack of sleep from the previous night was starting to catch up. I was so exhausted I could hardly move, while Grace looked a bit knackered as well. In my younger years I used to be able to hike for hours and hours on little sleep, but age and my allergies have definitely caught up to me. Alas, the two of arrived at camp and immediately spotted Miguel’s teepee tents. We exchanged warm-hearted greetings while he introduced us to Rie, who was about to venture off for a hike. Miguel informed us that Gameboy had strolled into camp in the morning, but had headed up to Karasawa for the evening, wearing only a pair of jeans! After dropping off supplies, Miguel and I headed inside to the hut, where I filled my belly with warm soba noodles and we traded stories. I’d known Miguel for years through his beautiful writing and stunning photographs, but this was our first time to meet face-to-face and we immediately hit it off, considering we have so much in common. Both of us come from design and architecture backgrounds, and we both suffer from debilitating health conditions. 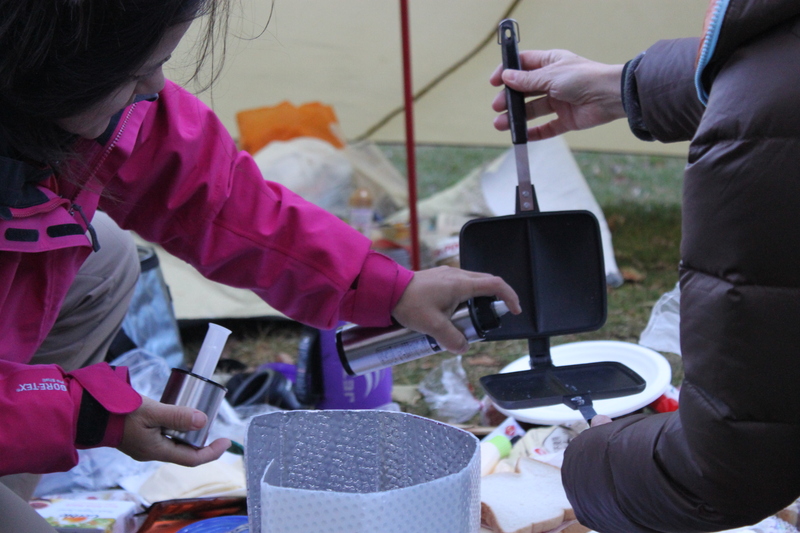 The next campers to arrive were Sonia and Isao, a Brazilian couple living in Gunma Prefecture. Tomomi soon followed suit, having come down from Oku-hotaka in the morning. She looked absolutely beat, as anyone would after traversing through Dakesawa with a heavy pack. She kept insisting she had to go back to Kamikochi to get supplies for the pizzas she was going to make, but Miguel and I insisted that she stay, knowing that an extra 14km of walking would not do her any good. I’m sure there would be enough ingredients between the rest of us to make up for what she had not brought with her. Miguel and I diverted her attention to a more important task: putting up her tent correctly. Miguel taught us the proper was to fasten tent pegs and some basic rope knots. 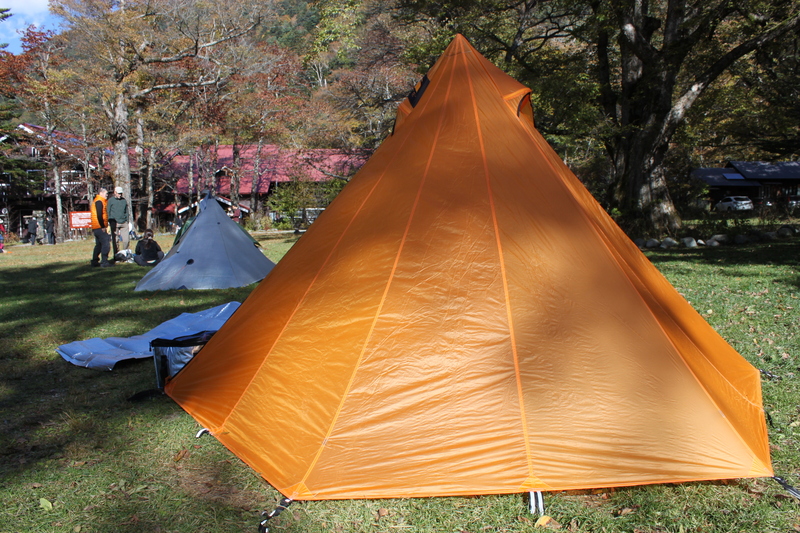 We tried to figure out why Tomomi’s rain fly wasn’t sitting securely on the tent frame. “I think it’s on backwards,” I modestly suggested. Sure enough, a 180-degree turn and we were in business. I believe Jana was the next to waltz into camp. She had caught a ride with Kevin and Mona, so we knew they wouldn’t be too far behind. As the afternoon light faded through the campsite, a makeshift dining table was set up on a plastic sheet, while the kitchen was assembled in the open Snowpeak shelter, out of the wind. Rie and Tomomi started making pizza, while Isao and Sonia took care of frying the Coxinhas. Grace began unpacking her gear while Miguel, Jana, and I looked on with disbelief. Eggplant salad, ham, cheese, bread, a full bottle of red wine, and just about every other thing imaginable. No wonder her kit was so heavy! During all of the frantic preparations, I noticed that I had lost sight of Miguel. Turning around, I saw him sitting quietly in his tent, labored breathing, while chowing down on a snickers bar. I knew immediately that his blood sugar had dropped too low, and the only course of action was to let him tend to his blood sugar. Although it was my first time to personally witness a hypoglycemic attack, I knew enough from prior reading about diabetes to know what to do: leave him be. Sonia and Isao looked quite worried, but understood once I explained the situation in Japanese. Once his blood sugar returned to normal then I knew he would once again join the party. Sure enough, about 15 minutes later Miguel emerged from the tent and came back to the festivities. Kevin and Mona were the next to join camp. Mona was a bit shy because of all of the people, but she eventually calmed down a bit as darkness enshrouded the campsite. Satomi was the final person to roll into camp, arriving just before dusk. Now that everyone was settled into their outdoor homes, the feast and storytelling began. We passed around plates full of food and everyone ate to their heart’s content. Despite our appetites, we had barely made a dent in all of the food. 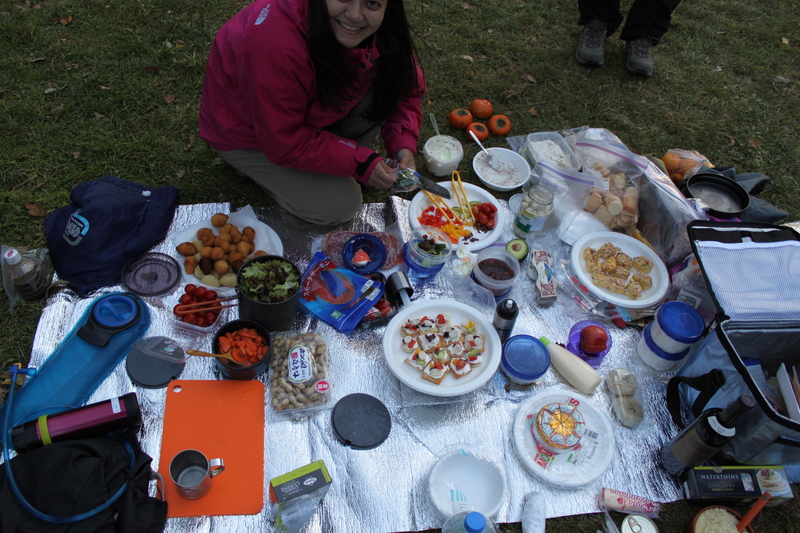 Between all of the appetizers, Jana’s salad bar, and Satomi’s couscous salad, we easily had enough food to feed the entire campsite. In the midst of all of our reverie, a lone figure approached from the direction of the hut. “Excuse me, is the the Hiking in Japan gathering?”, cried the voice. Grigory, the Russian Superman, had arrived into camp. Armed with only a backpack, we made him feel right at home by forcing him to eat our food, filtering red wine though a coffee filter (don’t ask!) and clearing out Miguel’s other tent so he had a place to sleep. Kevin even gave him his extra sleeping bag to use. Blankets were available for rent from the hut for only 500 yen, so there was no chance of anyone freezing to death this evening. 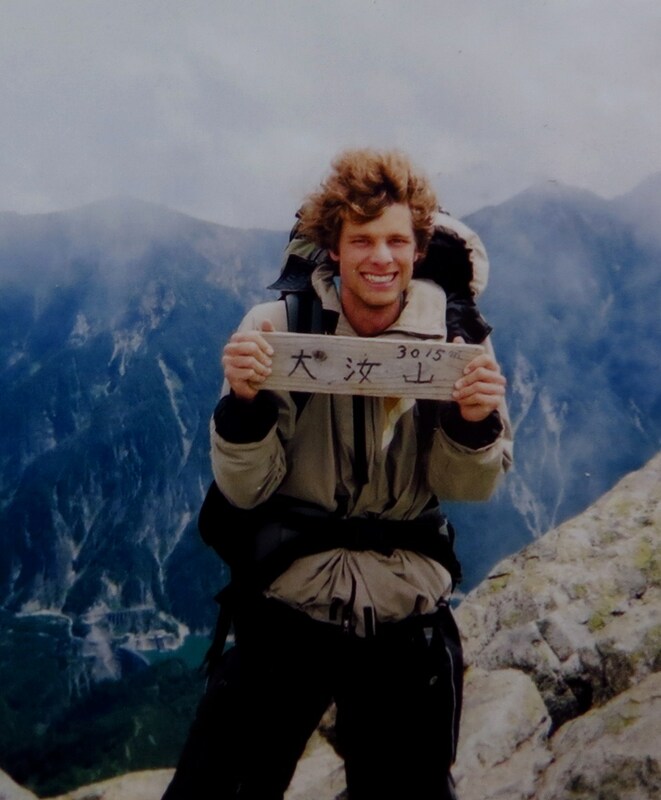 We all gazed in disbelief as Grigory told us he had left Kita-hotaka hut in the morning, traversed through the Daikiretto, had gone up and over Mt. Yari, and then down Yarisawa all the way into our camp. It was easily over 20km of walking, so it was no surprise he turned up long after dark. Sometime after 8pm, we wrapped up the leftover food and supplies and placed them in the open Snowpeak shelter and called it a night, halfway wondering if Gameboy would be the last to roll into camp. Forming a standing circle, we continued telling stories before Grace had to get back to hut before the 9pm lights out curfew. We easily could have stayed up all night chatting, but the majority of us were in dire need of sleep after taking so much effort to get there. I climbed into my bivy sack and tried to adjust to the low center of gravity. As the night progressed, the winds picked up considerably. My bivy sack shook from side to side, while I could hear the supplies in the open shelter starting to move. Sitting up, I noticed Miguel out and about the camp, tying down the food and double-checking all of the tents to make sure they were securely staked into the ground. A short time before sunrise, I heard another rustle in the campsite. Peering out of my bag, I saw that Grace was already out of the warm hut and preparing for breakfast. The alpine peaks were beginning to turn their crimson colors in the first light of the day, so I grabbed my camera to capture the scenery. Slowly the campsite came alive. Grace was cooking grilled ham and cheese sandwiches, while packets of coffee were passed around. Tomomi was the last person to emerge from her tent and rightfully so, as she looked the most weary the previous day. The warm rays of sun gradually filtered down into camp, while we shared more stories and ate fresh blueberries, courtesy of our Brazilian mountain sherpa Grace. Gradually the tents came down one by one and it was time to bid farewell to Tokusawa and make our way back to civilization. We marched in unison, slowly drifting apart with our varying speeds. Grigory and I led the pack, followed closely by Rie. Once at Myojin hut we took a break and waited for the others to catch up. Luckily they were only a few minutes behind. It was here that the group finally split. Miguel, Tomomi, Kevin, Mona, Satomi, Sonia, and Isao headed directly to the buds terminal, while Grace, Grigory, Rie, Jana, and I took the scenic route via Myojin pond. The pond was absolutely stunning in the incredibly clear weather. Mt. 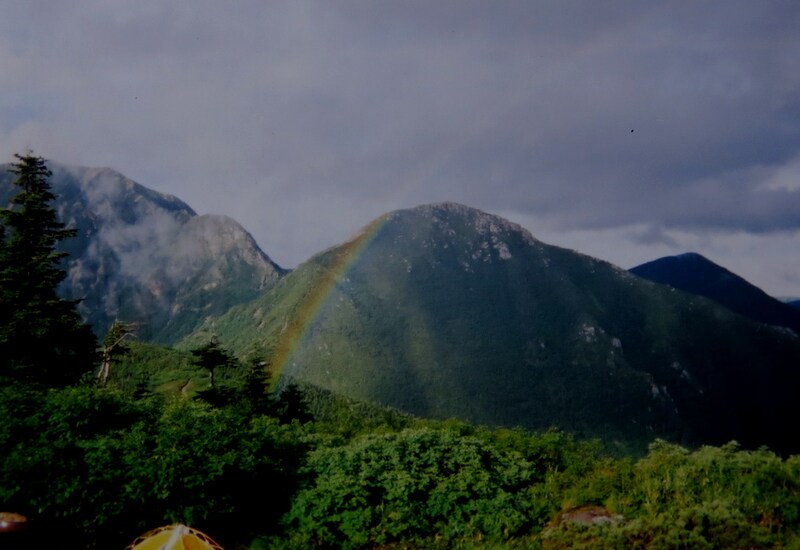 Myojin is often covered in cloud, so rare is a day when her reflections can shine bright and unhindered. The path between Myojin and Kappabashi is much more dynamic than the other side of the river: wooden walkways, vibrant foliage, pristine forests. Impressive enough to have Jana vowing to come back here the following weekend! After a quick snack at the hotel in front of Kappabashi, we crossed the bridge and converged upon the bus terminal, where an incredibly long line snaked around the visitor’s center. Over 150 people were waiting to get on the shuttle bus. Grigory was worried that he would miss his bus back to Tokyo, while the rest of us wondered if we’d make it out of here today. Amazingly, the wait was only about 30 minutes, and were were soon on our way. Grace and I got off at Sawando and back to her awaiting car. She drove me back to Toyama in time to catch the 6:30pm train back to Osaka. The train ride took over 3 hours but I slept the entire time, awakened only by the hand of an elderly gentleman who was shaking me back to reality. All in all the gathering was a sounding success, and we hope to make this a yearly pilgrimage. Full details/logistics of this traverse can be found in my guidebook. The rain fell in waves throughout the long, cold night. I slept with every layer on, including my raingear, for the sleeping bag served no purpose other than soaking up water from the bottom of the tent like a sponge floating in the kitchen sink. Fortunately the rains gave way to unexpected sunshine, and I packed up the gear one final time and headed up past Kenzan-so hut to the ridge just below the trail to Tsurugi’s rugged facade. My original plan was to drop the pack off here and head up to the summit for the last peak in the character-building traverse. Tsurugi is no mountain to take lightly, requiring plenty of physical and mental strength to successfully navigate the near-vertical rock walls. I sat on the ridge for nearly an hour, staring up at the approaching cloud. I knew I could make it up but had no confidence on the descent, and the peak has zero margin for error. One wrong foot placement and you would easily plummet to your death. The decision wasn’t really difficult to make. Head up Tsurugi, camp another night, and head back to Osaka in the morning. Throw in the towel now, and all that stood between a hot bath and warm meal was a steep descent to Murodo. As I shouldered my pack and turned my back on the peak, I felt the color return to my cheeks. As my friend John regularly reminded me over the years: “The mountains will always be there”. 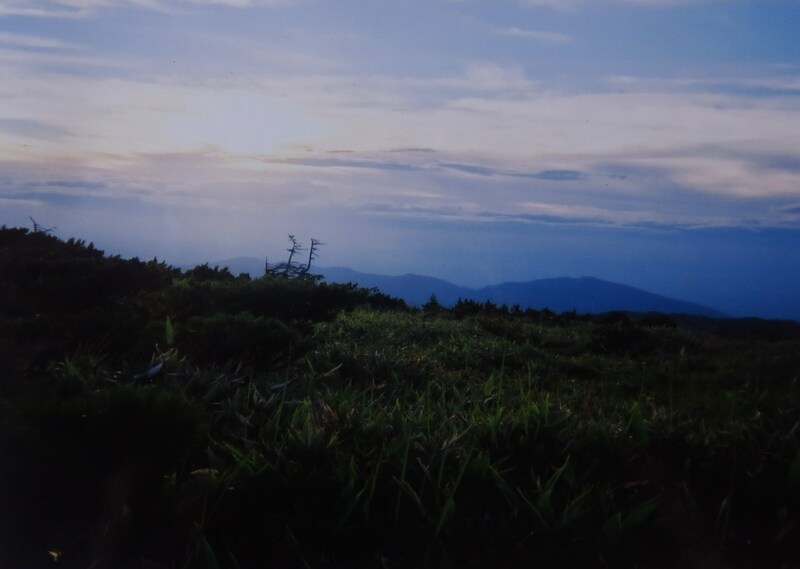 With the sun directly overhead, I pushed on the nearly flat traverse to Tsurugi-gozen, turned one last time to bid farewell to a mountain I would need to climb at some point, and meandered down to the tent city of Raichozawa. From here it was a short climb and detour through the steaming sulfuric steam verts of Jigokudani, and directly into one of the huts housing a hot spring bath. It was my first bath in nearly 10 days, and I could have stayed there for an eternity, if not for the hunger pangs that reminded me of my dire need for nutrients. I headed upstairs to the dining room of Migurigaike hut, feasted like it was my first meal out of the womb, and began to figure out how to get back to Osaka. After a few inquiries, I was told of the existence of Murodo, a massive bus terminal just up the hill. After spending 8 days in relative solitude, the swarm of daytripping tourists was a bit too much to handle. I bought a bus ticket and got out of there as quickly as I could, and vowed never to return. Sometime after dawn broke, I awoke to find my sleeping bag completely submerged in a puddle of water that had formed at the bottom of my tent. Though the rains had abated, I still faced a dilemma about what to do with my useless canvas bed. I ate, organized gear, and set off in complete silence, a true sign of low morale. I’m sure Goshiki-ga-hara is a spectacular place in perfect weather, but in the early morning fog the scenery looked the same as every other day on this godforsaken trek. I definitely needed something to snap me out of this bitter mood. 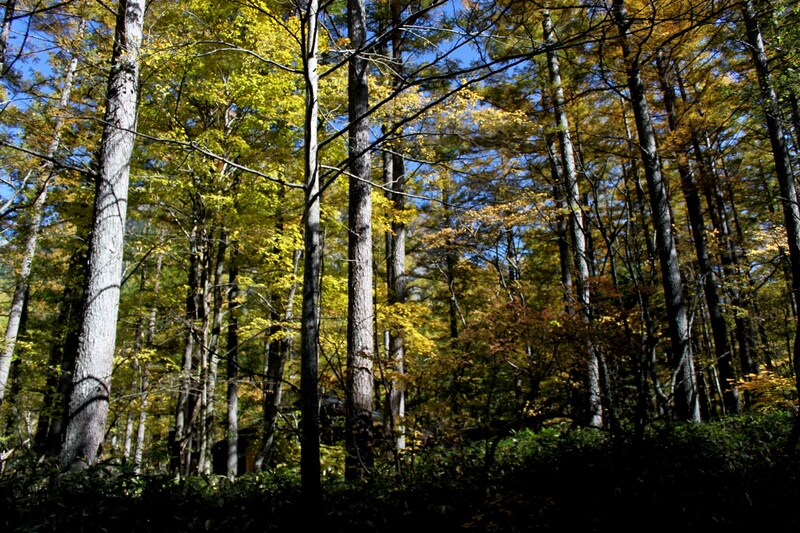 As the trail left the flats and climbed towards Ryuuou-dake, something miraculous happened. All of a sudden, just like an airplane climbing to cruising altitude, I broke out above the clouds and had my first views above the treeline since the summit of Mt. Yari five days earlier. Directly in front of me, Tateyama’s horse-shaped ridge towered above the Kurobe valley far below, and all those ill feelings bottled up inside vanished in the mist, the smile finally returning to my glum complexion. On the bald summit of Mt. Jodo I took my first break of the morning and admired the lingering snowfields scattered across the alpine plains like the sand traps of a massive golf course. 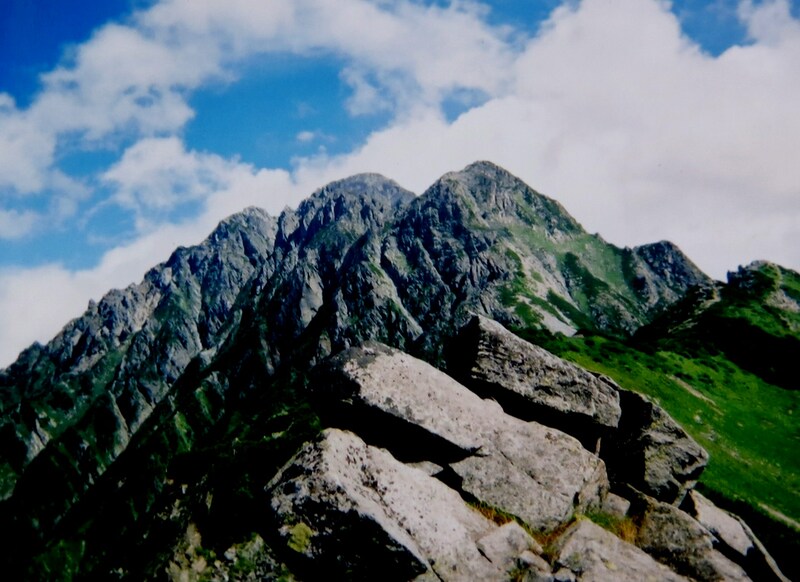 From here the trail drops directly to the main saddle below Tateyama and meets up with the main trail coming up from Murodo. At the beginning of the long descent I run into a foreign male, my second of the entire trip. 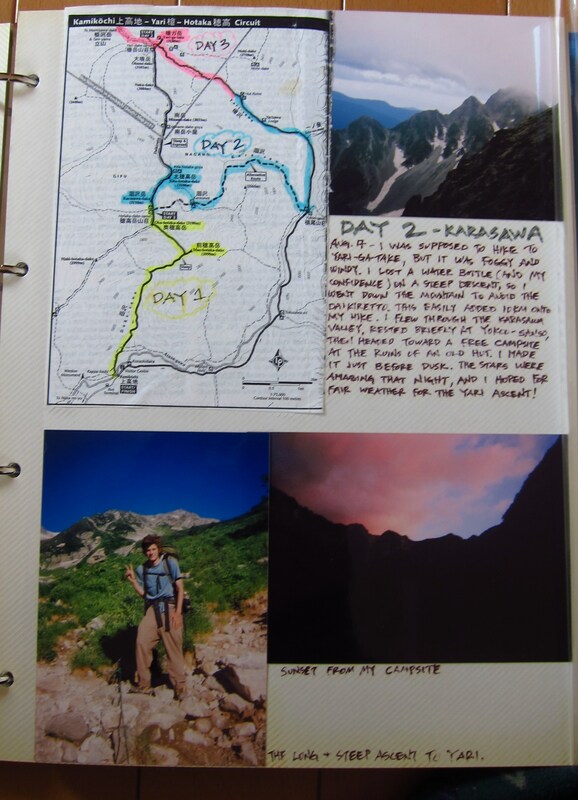 He was on his way to Kamikochi, along the same route I had just completed. What knowledge could I possibly share about a route I had hardly even seen? The best I could conjure up was a hearty “Good Luck” before continuing on the trail. Ten meters later I tripped on a rock, flipped forward, bounced off the back of my pack, and somehow landed upright, which likely prevented me from rolling down the rest of my trail like a runaway tire. This stumble could have been avoided if I had trekking poles with me. Another lesson learned on this never-ending trek. Once at the saddle, I ran into crowds the likes of which I had not seen since Kamikochi. Several hundred vertical meters down on my left I could make out the bus terminal at Murodo, one of the most popular entry points to the Kita Alps. The climb up to the shrine took just 15 minutes, as I passed by heaps of daytrippers gasping for breath. I had over a week to acclimatize while most of them had only just arrived from sea level. At the shrine I took a brief break before pushing on along the ridge to the official highpoint of Mt. Onanji. I took a quick snapshot before being swallowed by the advancing cloud. The rest of the ridge to Bessan was once again in that all-familiar backdrop of white. 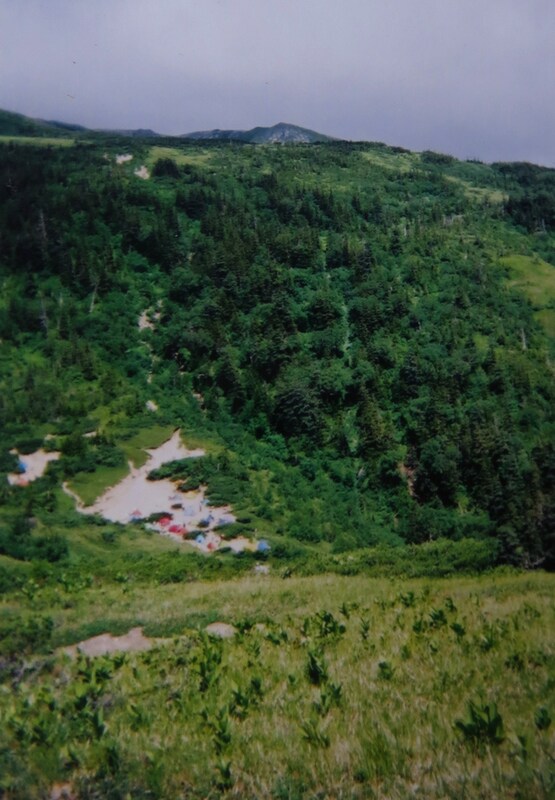 I wasted no time in dropping to Tsurugi-Gozen hut and finally down through the snow fields to the tent city of Tsurugi-sawa, where I unsuccessfully tried to dry my sleeping bag in the cold mountain mist. This drizzle soon turned into a full rain storm, as I once again retreated to the toilet block, which was smaller and stinkier than the one at Goshiki. What did I do to deserve the wrath of Mother Nature? An hour or so into the rain storm, a man approached me and asked in clear English if I needed a helicopter rescue. Either he was out for a quick buck (copter rescues in Japan are astronomically expensive) or he somehow knew the sorry state of my gear. I politely declined and eventually crawled into my tent. Using my wet sleeping bag as a ground sheet, I rigged up my large pack to serve as a dry, albeit very uncomfortable bed. It was going to be a long night, but the last one I would have to spend in discomfort. 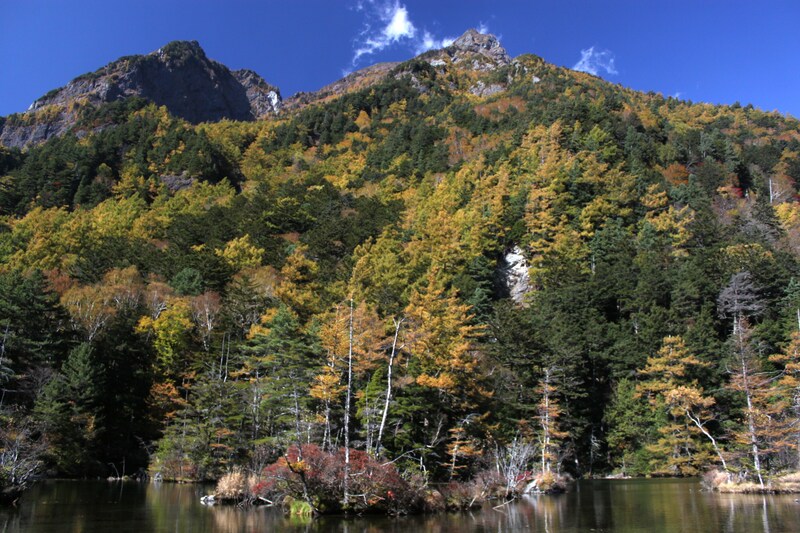 From Sugo-norikoshi campsite, the peaks rise from the earth as if pulled up by Ninigi no Mikoto himself. Through the translucent rays of the rainbow and whispy clouds I could just make out the path leading up and over the horse-like contours of Mt. Ecchuzawa, which checks in at just under 2600m above sea level. This route is a breeze in favorable conditions, but those of you who have followed this saga from Day 1 will note my penchant for attracting horrendous weather. 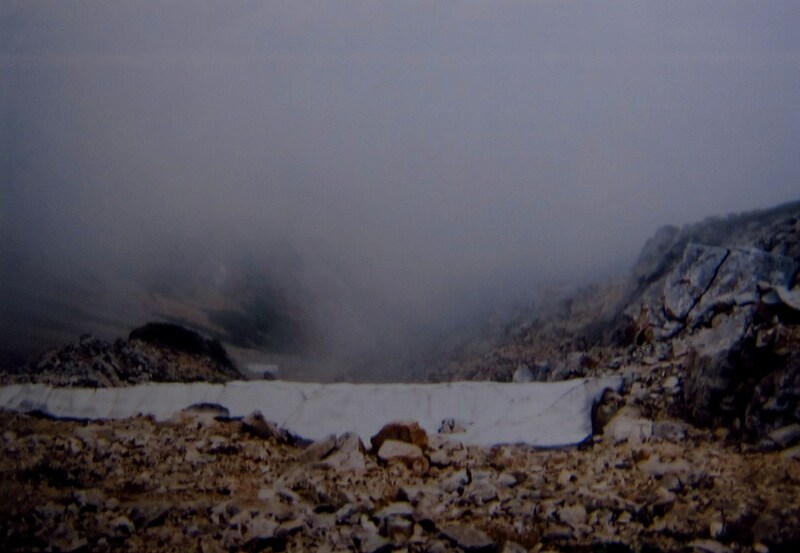 So it was under heavy cloud that I broke down camp and started on my ascent into the unknown. Although dry, the sky looked as if it would empty its bladder at any moment. I raced up to Sugonokashira in my signature blue singlets with a rare smile on my lips. For cloudy as it was, the fog had stayed away, offering favorable views towards the south. My destination, however, was to the north, where a blanket of white cut off everything in sight. You really weren’t expecting anything less, were you? The maps say to allow at least 6 hours from Sugonorikoshi to Goshiki-ga-hara but you can easily add an hour or two when trying to navigate the tight squeezes with an oversized pack. There were a few places where I physically had to dismount and drag my gear behind me. After a week on the trails, boulder scrambling tends to wear on your nerves a bit, and the chains were a reminder to not let the mind drift off too carelessly. Once out of harm’s way, I started the long descent towards Goshiki, where I had to make several important decisions. The hut at Goshiki has a warm bath, my first chance of washing my body since leaving the river in Kamikochi a week before. While tempting, there was also the other option of giving it all I had, pushing on another half a day and actually reaching Tateyama, where a real hot spring awaited. While these scenarios played themselves over and over in my delirious head, nature had decided to make the decision much easier for me by dropping buckets of cold liquid across the trail. The rain that now enveloped my alpine surroundings had made the previous storms on my trip seem like drizzle. I hastily strapped on the pack cover, threw on the rain jacket and coasted down to Goshiki hut. Once inside, I ordered a hot bowl of udon, my first and only hut-cooked meal of the entire traverse. After wolfing down the noodles, I inquired at reception about being able to have a bath. “I’m sorry, baths are only for customers staying in the hut”, replied the gruff gentlemen, who’d obviously grown weary of turning away campers. My heart sank below my bowels as I sat back on the bench and consulted my finances. 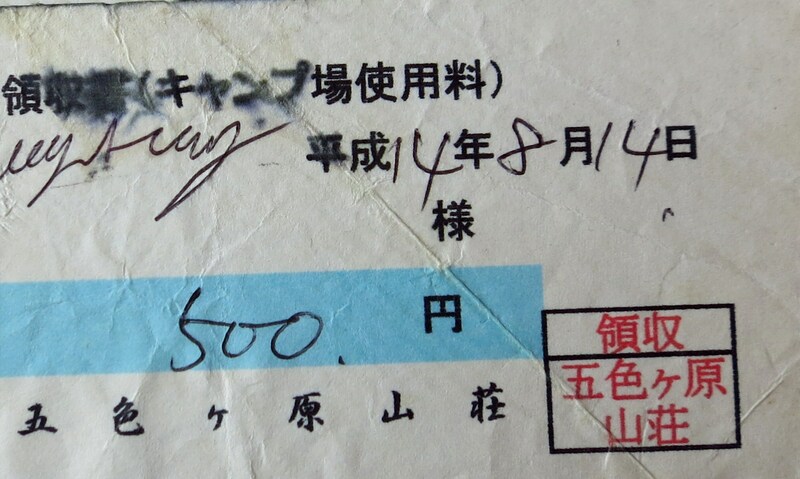 In my wallet lie 12,000 yen. A bath would cost a minimum of 6000 yen (the cost of staying in the hut without meals), which would leave me 6000 yen to not only get off Murodo, but catch a train back to Osaka. On the contrary, a night in my tent would set me back only 500 yen. Rationality prevailed as I put down my coin and sulked my way down to the campsite. I set up my tent in the rain and retreated to the toilets to wait out the storm. My tent, if you could call it that, was nothing more than a glorified lean-to, with only one tent pole in the center. Both ends had to be staked down, and once inside you could do very little other than lie flat on your back and look up at the canvas ceiling. All of the other tents I’d seen on this trip had plenty of head room, where occupants could leisurely sit up, play cards with their tentmates, and wile away the time while sitting out the storm. Claustrophobic my dwelling was, so I simply sat at the edge of the foul-smelling concrete bunker and pouted. I was not a happy camper and longed for nothing more than a hot bath and a home-cooked meal. Eventually nature called for most of the campers, so I was able to pass the time by first startling them by sitting like a cold, lost soul in the toilets, and finally making small talk by inquiring about trail conditions to Tateyama. The small talk seemed to help, for the leader of yet another wandervogel club came to the rescue and offered a 1kg bag of uncooked white rice as a kind token. I guess my lack of supplies must have gotten out to other campers, as I was presented an apple by an elderly woman a few moments later. The smile slowly returned to my ailing complexion and I chomped on the fruit and watched the torrential rain fall unabated. Eventually dusk settled in, and I hurriedly retrieved my cooking gear from my home and cooked up some of the white rice in the toilet, which turned into the consistency of porridge because I couldn’t be bothered trying to measure the proper amount of water without a light source. Belly stuffed, I left my cooking gear as is in the restroom and settled in for a long night of fitful sleep. Would this nightmare weather ever end? “Hi Wes”, echoed the voice through the faint darkness of the pre-dawn light. A lone female figure gently approached my alpine kitchen, presenting a handful of rice crackers as if making an offer to a deity. “Yuka”, I screamed, stunned beyond belief that I would run into one of my students here, 2400 meters above sea level and hundreds of kilometers from home. We chatted for a few minutes while the rest of her wandervogel club members broke down camp. In the summer you run into a lot of these university mountaineering circles, who usually carry enormous packs and hog most of the sacred camp space by setting up 12-man tents! A few of her fellow club members joined in the conversation before the group chugged like a freight train through the gentle meadows of Kumanodaira. I was headed in the opposite direction, back above the tree line for the rest of the day, but this chance encounter gave me the energy boost I needed and helped keep my mind off the sad state of my scab-encrusted knees. The first half an hour of tramping was fairly easy going. 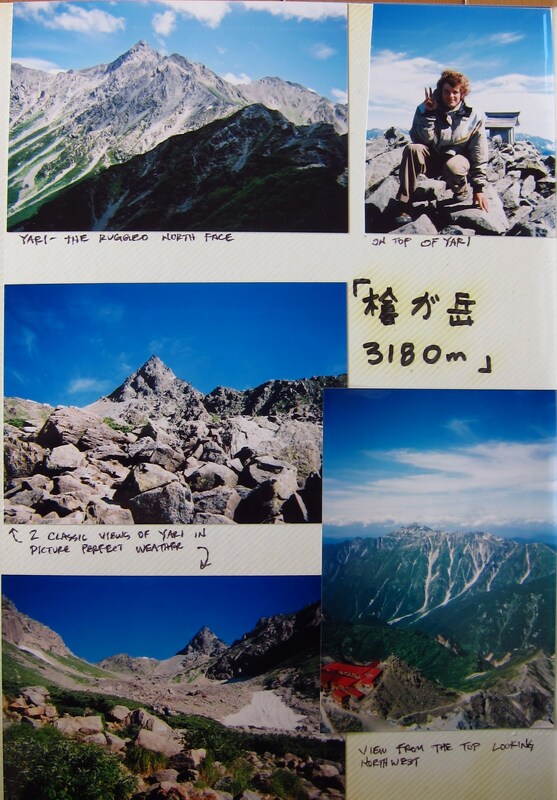 Once I reached Yakushi-daira, I had my first and only mobile phone coverage of the entire trip. 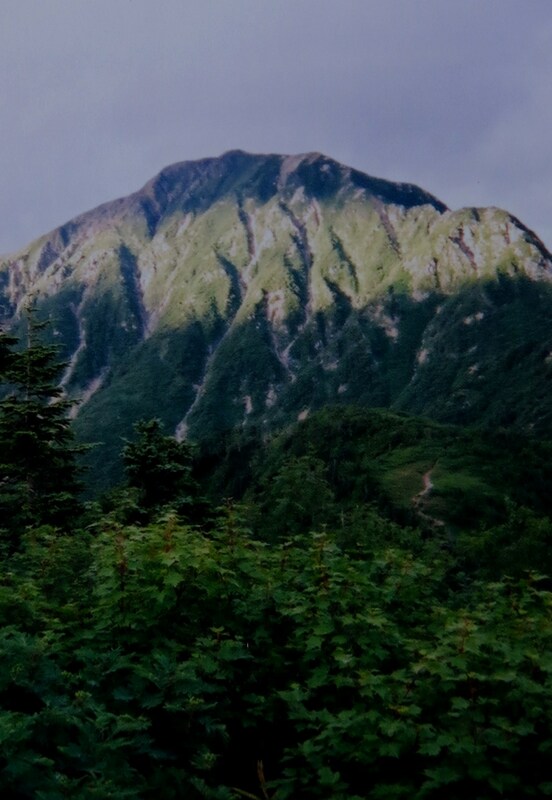 Nowadays with the right smart phone you can get uninterrupted coverage in most of the Japan Alps, but a decade ago your only contact with the outside world was with the mountain hut staff, who had radio contact with their main office in the towns below. I spent a few minutes clearing my inbox of messages, called my roommate to let her know I was safe, and packed up the device just before disappearing into thick cloud. 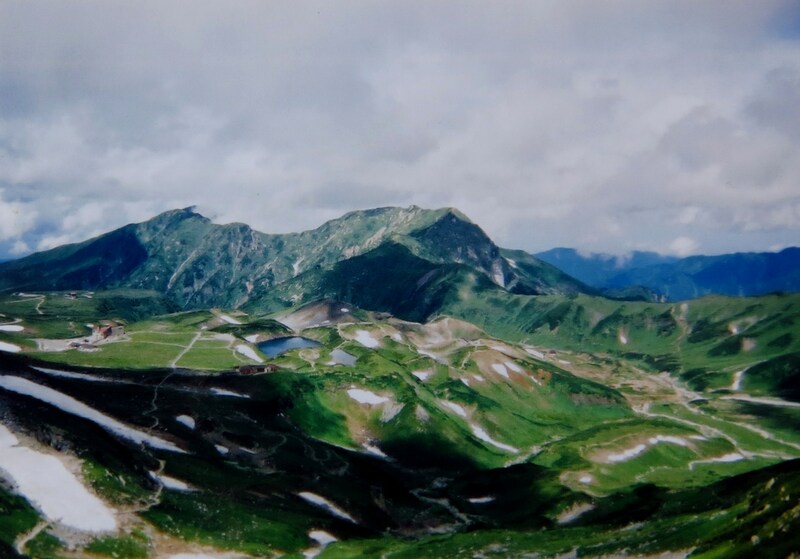 There would be no breathtaking views of Yakushi’s unique landscape. Instead, I’d see that all-too-familiar white background. The ridges of the Alps looks pretty much the same when caked in fog – a repetitive mix of ankle-high brush pine, alpine flora clinging tightly to whatever soil could be grasped between the endless field of burrito-sized rocks. 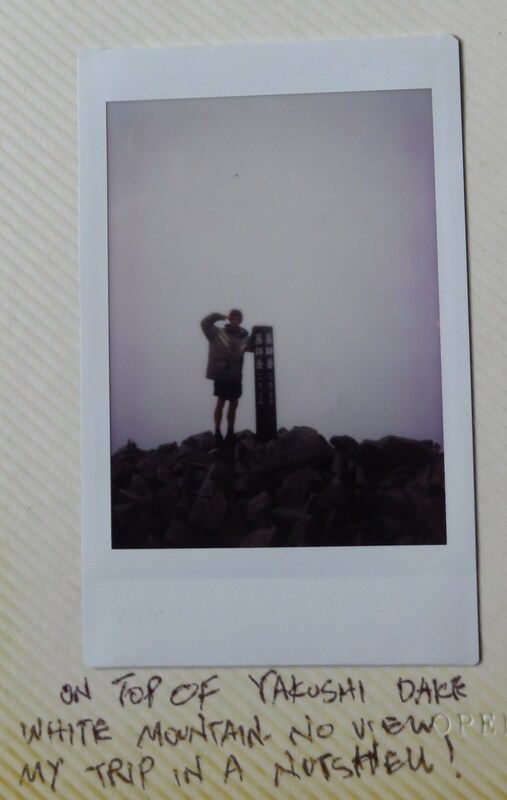 On the summit I met one other hiker armed with an instant camera who offered to snap a summit proof. This photo would come in handy later on the traverse when encountering other hikers inquiring about the weather conditions. Somewhere on the ridge between Yakushi and Kita-Yakushi the skies opened up as I scrambled to put on the rain cover. The rain came down in sheets, soaking me to the bone. All I could do was to push on, hoping to drop back down to the tree line before hypothermia set in. “I thought the rainy season was over”, I repeatedly mumbled to myself. Mid-August is generally a time of stable high-pressure that tends to bring favorable climbing conditions to Japan’s loftier peaks. Someone forgot to relay this information to Toyama Prefecture. After a few hours of trance-like slogging, I arrived at Sugo-nokkoshi hut in unexpected sunshine. It was sometime in the early afternoon, and once I’d set up home and cooked a modest meal the second round of rains swept through the campsite. 20 minutes later I popped out of my shelter only to be greeted by a rainbow. My neighbors in the campground had just completed their first day of alpine trekking. 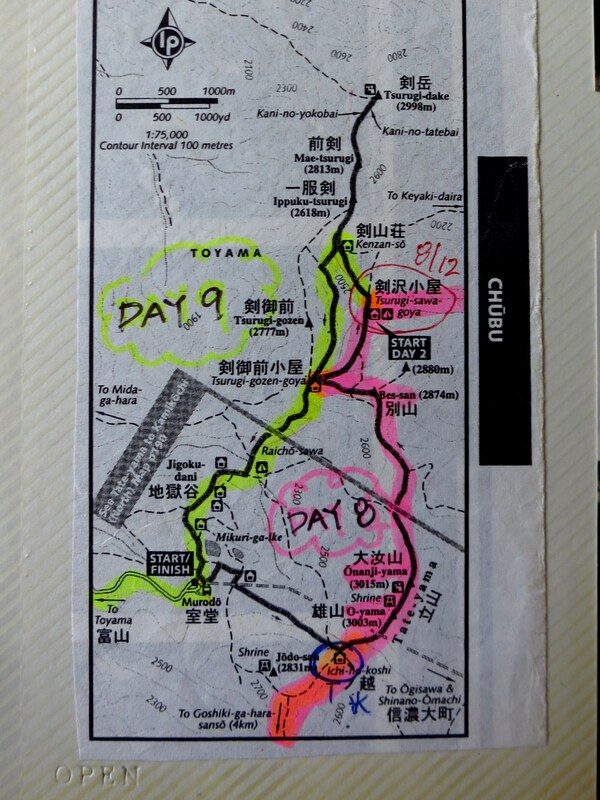 They had started in Tateyama earlier in the day, and with their unbelievably quick pace they’d likely make it to Mt. Yari by the time it would take me to arrive in Murodo. Still, it was comforting to know that my destination was only 1 day away if I really pushed myself. All of that would depend on what nature threw at me the following day. With dreams of sunshine and blue skies I drifted off to sleep, trying to rest up my sore knees for the final push to Tateyama’s sacred abode. The rain continued on and off throughout the chilly night, the tent fly rustling continuously in the steady winds like a flag perched high on a ship mast. Early the next morning I boiled water for oatmeal inside the tent, thinking of every possible excuse to delay my impending assault on Mt. 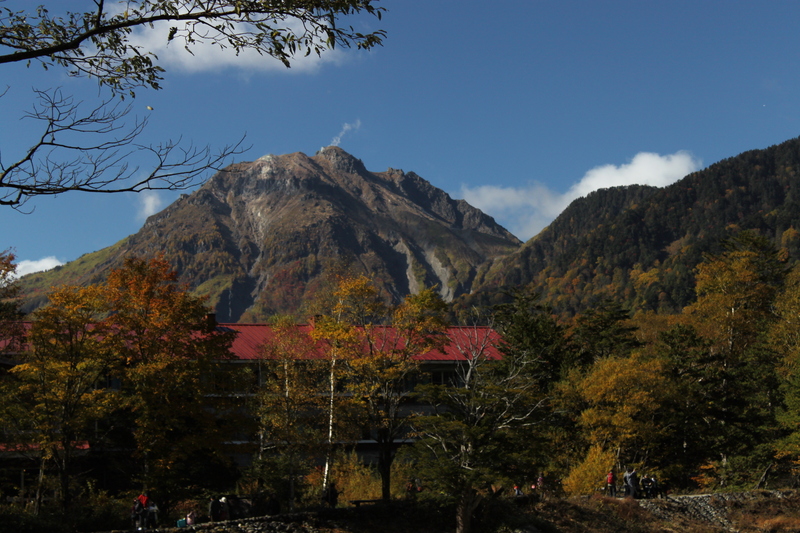 Kurobegoro, the giant peak that loomed somewhere above the now-deserted campsite. I came up with a makeshift plan: pack up everything while still inside the tent, put on my shoes, jump out of the tent, roll it up into one large messy ball, tie it to the outside of my pack, and march off into the sunset. If only things could be so easy. The first struggle came after breaking down camp, when I realized my waterproof pack cover wouldn’t fit over the bulging vinyl of the tent freshly strapped to the side of my pack. Even though the rain had stopped, the heavy cloud brought drizzle that could easily soak my entire kit if left exposed. In came plan B, which involved stuffing the tent in the small gap between the top of my pack and my head, forming a makeshift pillow. The only problem with this is that I physically couldn’t reach around and do it myself once I had put my pack on. Luckily, someone at the hut came to my rescue, securing my gear steadily in place. Of course this meant that I wouldn’t be able to take off my pack at all until arriving at my next destination. So up I went, back above the tree line into the suffocating cloud. The next couple of hours involved a marching ascent through what I’ve been told is one of the most picturesque cirques in all of the Kita Alps, but all I saw was a alternating pattern of rock and snow. Eventually I reached the junction just below the high point. Turning left I topped out on the summit of Kurobegoro, my 6th Hyakumeizan, and turned around to admire the endless array of peaks directly behind me. Even though I could only see 1 meter in front of me, I tried to imagine what I should have been viewing if mother nature had decided to reward me with some decent weather! Dejected, I pushed on in silence. An hour further down the ridge, through a steep, heavily eroded gully, I popped out of the clouds, and got my first views in 3 days. Directly in front of me, a thousand meters below, sat the pristine shores of Lake Arimine. Further east, I could follow the contours of the ridge line all the way to Tarobei hut, where I’d planned to spend the night. Beyond, the mountains rose again to a thick bank of white, obstructing my view of Mt. Yakushi, which I had in mind for the following day. The views helped brighten the mood, as I coasted along the well-worn ridge to campsite on the saddle between the hut and the long climb to Yakushi. After paying the caretaker of the campground, I scurried through the rock-filled area, searching for the perfect place to pitch my tent. Alas, on the other side of the clearing sat a perfect place to call home for the night, and in my excited haste I neglected to check my footing. Suddenly, as if pushed by a supernatural force, my left ankle caught the guy-wire holding up a massive 10-man tent. Instantly I was sent airborne, landing on my belly with the full force of my heavy pack sandwiching me on the rocks. My knees absorbed most of the impact, sending shockwaves through my body and contorting my face into a grimaced caricature. Instantly the tent occupants rushed outside to my assistance as the screams of pain echoed through the valley. Two guys unstrapped my gear as another two helped me to my feet and escorted me back up the hill to the medical clinic inside Tarobei hut. “Just some surface wounds”, replied the medic, who patched me up and sent me on my way after a speedy 15-minute examination. Even though the medical service is free, they do request a 2000 yen “donation” to help cover costs. Still, getting a wound properly treated in the alpine is much better than risking an infection. 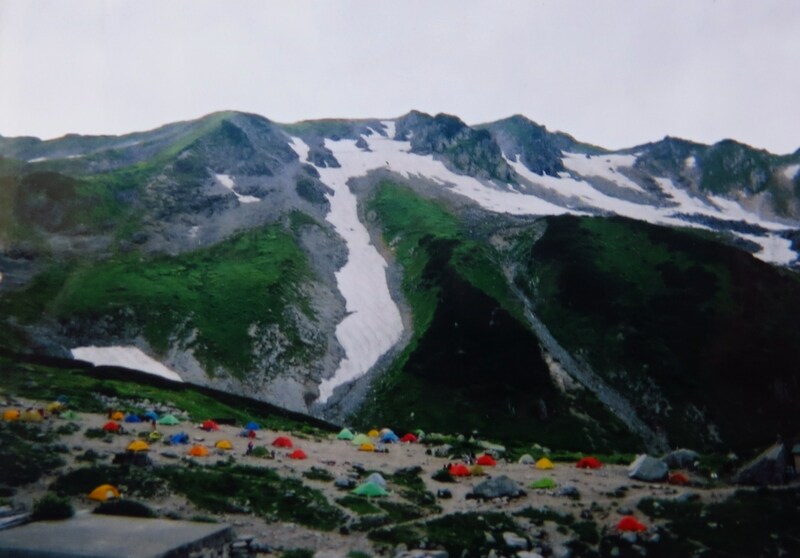 The rest of the afternoon I lazed away at the tent village, chatting with other hikers about the long traverse to Tateyama that lay before me. I was at the halfway point in traverse, both in terms of distance and time, and could only hope that my newly-battered knees would mend in time to complete the man-powered voyage. The rain came down in a steady rhythm not long after dusk. Fortunately I had already finished cooking and brushed my teeth in the washroom of Sugoroku hut. My face rested just a few inches from the canvas on the tiny tent as condensation covered the rain fly. Below my body lay small pebbles protruding against the vinyl of the tent floor – I had abandoned the luxury of a sleeping pad in order to save pack space, which seemed like a wise choice at the time. Early the next morning the rain subsided, but thick mist enveloped everything in sight. After gearing up, I hit the desolate trail, foregoing the ridge of Mt. Sugoroku in favor of the sheltered protection of the valley. Picking my way through the boulders and snow fields, I topped out on Mt. 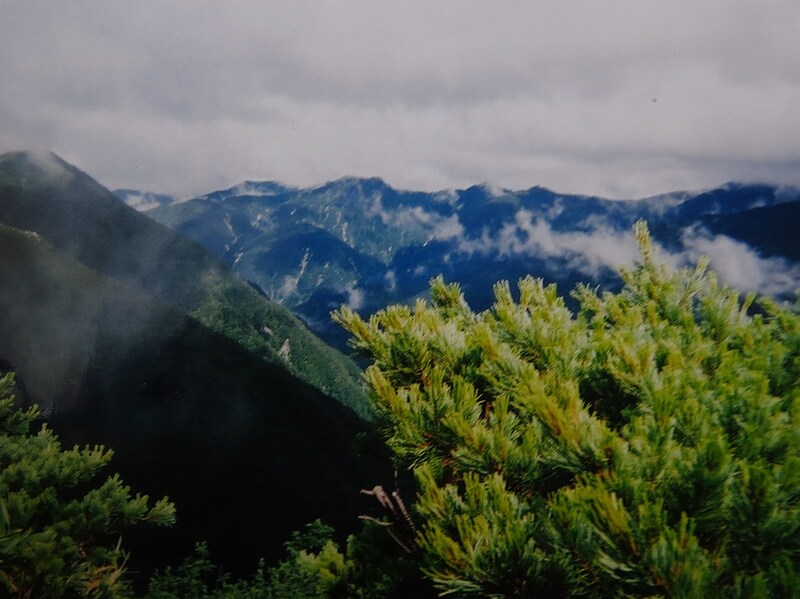 Mitsumata-renge, where I met the full force of the gales sweeping over the ridge. Though the rain had dissipated, the moisture in the cloud cover soaked my rain jacket thoroughly, sending shivers down my exposed legs. Just like the past 3 days of my adventure, I’d been hiking in shorts and didn’t even have rain pants among my limited gear inventory. The next stretch down to Kurobegoro hut was comfortable, since I had descended back down to the tree line and was protected from the elements by the brush pine and deciduous tree cover. I walked as if in a trance though, thinking nothing except for the hunger pangs in my abdomen. Once I reached the hut, I had a crucial decision to make. I could carry on traversing 4 or 5 hours to Yakushi-toge, or pack it in and call it a day. The decision wasn’t really that difficult to make, since I was soaked to the bone, ravishingly parched, and short of stamina. Up until this point I had survived three very long and tough days of hiking, so it only made sense to have a bit of a break. I was the first one to set up camp, shortly before 1pm. After cooking lunch, I drifted off to sleep dreaming of sunshine and a warm breeze. All in all I had hiked less than four hours, but enjoyed my lazy day, even if most of it was spend in the cramped confines of my tent. The rain once again pushed through around 5pm, and didn’t let up until sometime after dark, when I roused myself to hastily cook up some grub before the next squall moved through. Would this low pressure system continue its stronghold on the area, or would fair skies prevail? 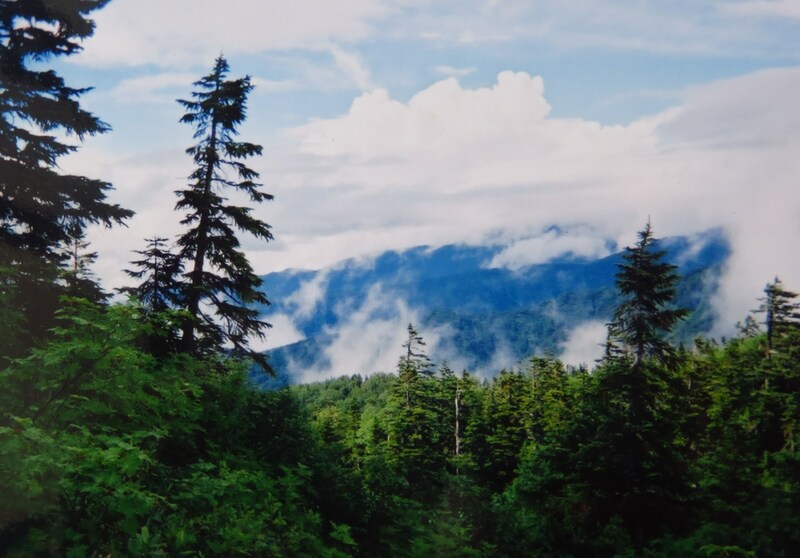 I had no contact with the outside world: no TV weather forecasts, internet connections, or any instruments for recording barometric pressure. I’d simply have to wake up and deal with whatever mother nature had in store. I broke down camp sometime in the early morning of my 3rd day in the backcountry. It’s amazing how quickly you can disassemble everything after a couple of days of practice. The high pressure system once again held up, as I followed the stream through Yarisawa until the waters petered out into the alpine. The route was well-marked with tape on the creeping pine and yellow paint marks on the rocks. I kept a pretty steady pace, stopping only to replenish my water bottles once they’d been emptied into my dried belly. I’d pretty much put the maps and my watch away, instead relying on the movements of the sun to gauge my progess. 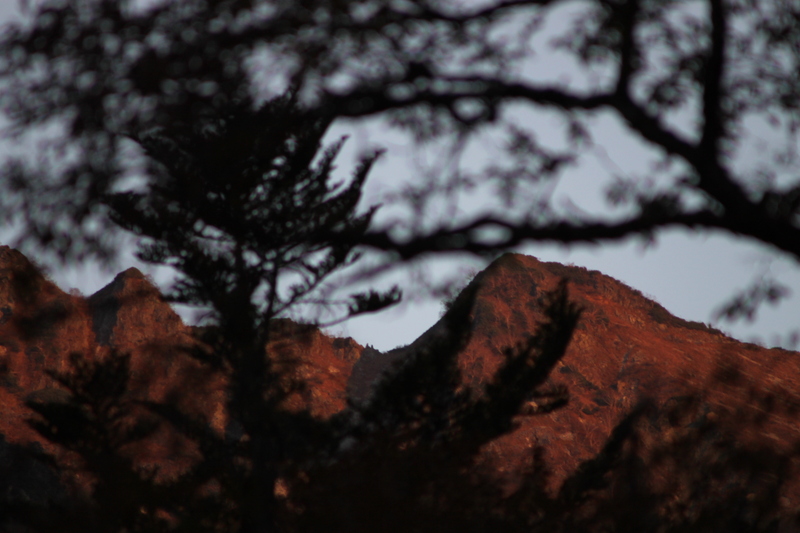 Scores of hikers filed down through the valley after catching the first rays of the sun from Yari’s speak-like point. My target peak was clearly visible on the horizon, though it took nearly 5 hours of tough slogging to reach the ridge. 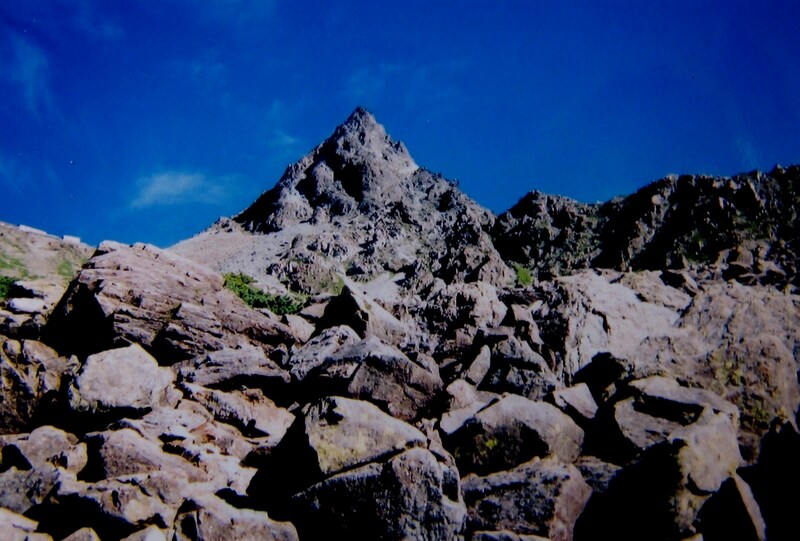 Once at the hut, I dropped my gear off and raced up the chains and ladders to the summit. Luckily, only a handful of people were making their way up the summit, since most trekkers were well on their way to their waiting accommodation by the toll of the midday bells. After a quick summit shot, I backtracked to the hut and ate a lunch of instant noodles. I chatted with a group of university students who were on an excursion through their school’s wandervogel club. They gave me some good advice about the ridge between Yari and Sugoroku hut, my target for the day. “It’s long but the path is easy to follow”, encouraged the leader of the group. After posing for photos, I once again fastened my sagging pack and picked my way through the paint rocks on the main spine of the northern Alps ridge. I soon caught up with 2 men also making the trek to Sugoroku, so it was nice to actually do part of the walk with some companionship for a change. Up until this point I’d passed hundreds of other hikers, but my late starts and awkward decisions meant I’d walked in solitude most of the time. 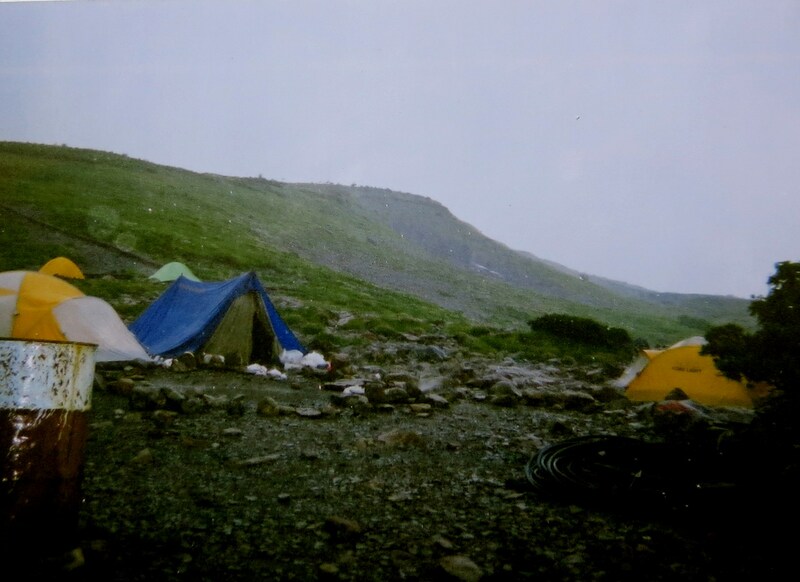 We rolled into camp sometime before 6pm, as I searched for a place to pitch the tent among the city of trekkers. A word of advice for future hikers: the best campsites are usually gone before lunch. Once settled in, the skies lit up in brilliant colors before the fog rolled in for good. Little did I know how shy these alpine ridges can be in the summer. The cloud usually comes in shortly after sunrise, hangs around most of the day, lifts a little before sunset, and settles back in most of the night before lowering itself to the valley floor before sunrise, only to repeat itself the next day. Of course, that’s the pattern during a period of high pressure, but once the storm systems start to move in, it’s an entirely different story as I was soon about to find out. Day 2 dawned clear, but my late start meant I had the first climb completely to myself. You see, the sun rises shortly after 4am in summer, but my body screamed for extra rest after the epic climb from Kamikochi the previous day. I opted for the leisurely alarm time of 7am, and awoke to find the campground deserted and hikers well on their way to wherever they were headed. After cooking breakfast and breaking down camp, I started the short climb to the summit of Mt. Karasawa. 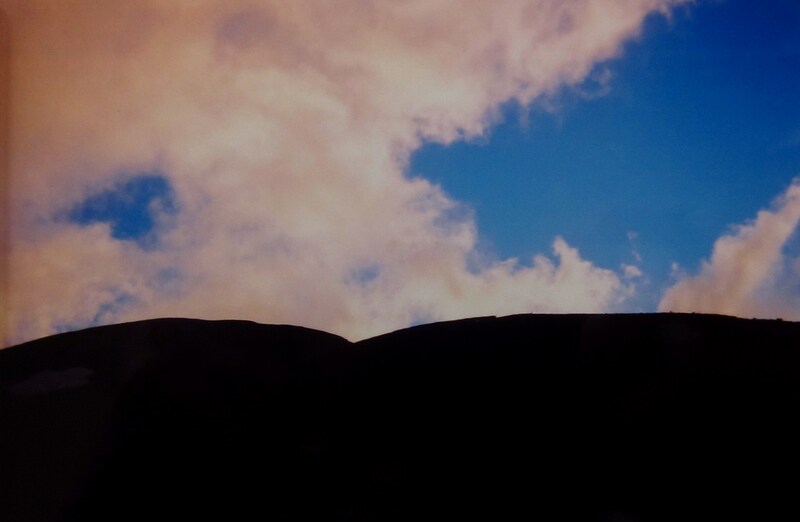 Cumulus clouds floated strikingly close to the ridge line, but luckily skies to the south were still clear. Mt. Fuji stood out like a thimble on the infinite horizon as I lazily admired the views. From the top of Mt. Karasawa, the trail strangely vanished. I searched all around the summit for the paint marks that would take me down the other side, but they were nowhere in sight. Perhaps I needed to retrace my steps back to the hut? Or maybe…. I heard a faint sound coming from the north ridge. Suddenly, as if appearing from the subterranean depths of hell, rose a bare hand, quickly followed by the torso of a middle-aged woman. 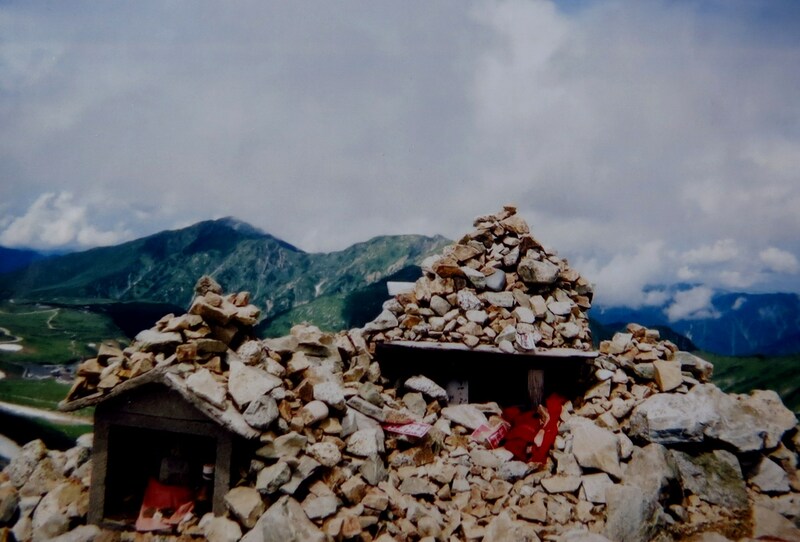 She collapsed on the summit next to me, chanting taihen like it were some kind of Buddhist mantra. The rest of her climbing party eventually followed suit. I peered over the edge of the peak in the direction they’d just climbed, only to find a metal chain descending vertically into the depths below. “You’ve got to be kidding me,” I screamed, wondering how on earth I was going to lower both myself, and my hefty gear down the precipice. I took 3 deep breaths, turned 180 degrees, and slowly lowered myself, using not only the chains, but also the rock edges for stability. I felt the footholds but could not see them, repeating this painstaking procedure meter by meter until reaching the first landing point. About halfway down, one of my water bottles dislodged itself, plummeting down the abyss into a painless death. Fortunately it did not hit any of the hikers below me waiting to ascend or my hiking days would surely be done. The ridge continued in this fashion for around 30 minutes before flattening out a little and skirting around more rock formations. The clouds once again swept in, blotting out the death zones just below me. Here, out of the depths came a foreigner from the opposite direction. 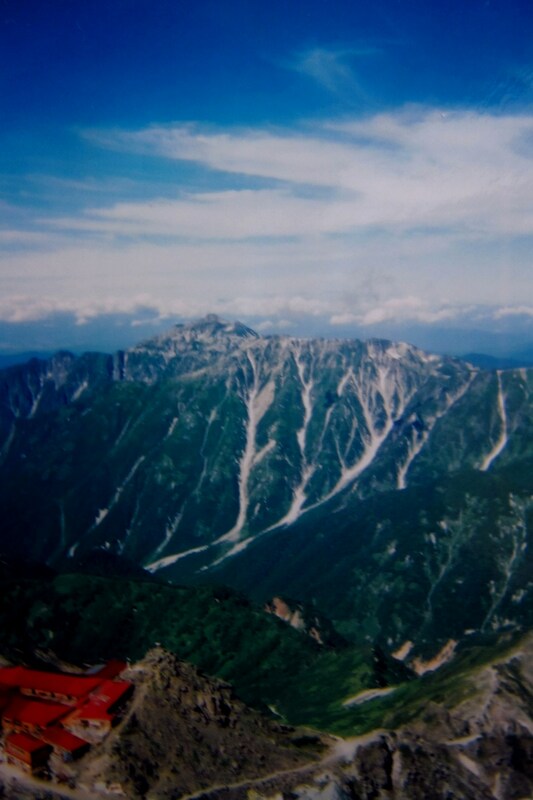 He had started in Tateyama, and was making his way up the route I’d traversed yesterday. We chatted about 20 minutes, sharing course information and advice. “Watch out in the Daikiretto”, he added ” especially if the cloud is in.” The words could not have been more discouraging. With the clouds came the mist, the damp rocks gradually reaching the color and consistency of a river bed. 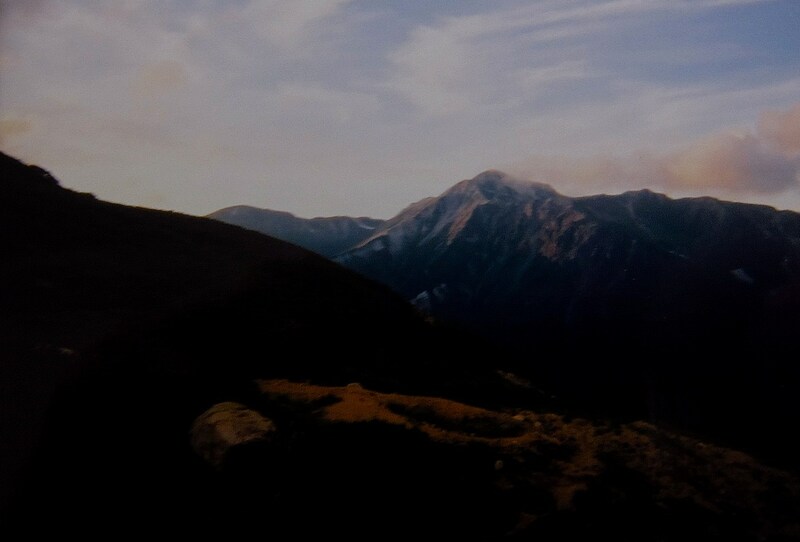 An hour or so later I arrived at Mt Kita-hotaka and sat on the deck of Kitahotaka-goya, pondering my predicament. Just below my feet lay the entrance to the Daikiretto, a serrated edge of crumbly rock and near-vertical cliff face. 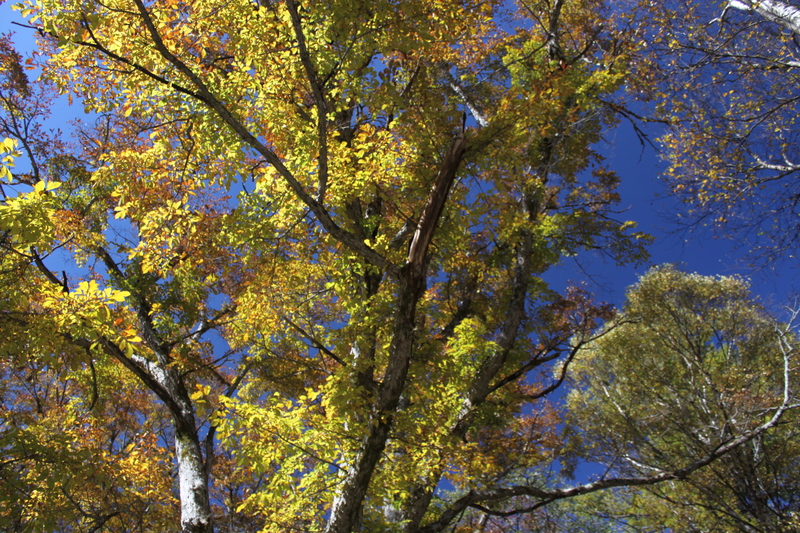 Every year a handful of hikers either fall to their death or are critically injured. The crawl from Karasawa-dake to here had completely zapped my confidence, which is exactly what you do not need when faced with a mentally exhausting climb. I came up with an alternative plan. Instead of continuing along the ridge, why not drop back down to the valley and climb Mt. Yari from Yari-sawa? Sure it might add an extra day to the traverse, but surely it’d be safer than tempting fate on the chains and ladders in the daikiretto? And with that I descended, 800 vertical meters to the massive tent city of Karasawa. From Karasawa, I continued the long descent through Yokoo valley to Yokoo-sanso, where I turned north past Yarisawa Lodge and up to the campsite of the ruins of Yarisawa hut, at 1900 meters above sea level. After pitching the tent and cooking dinner, I drifted off to sleep with the sounds of thunder high on the ridge above. A thunderstorm was ravaging the alpine, but here in the valley everything remained dry. If I’d stayed on the ridge I’d surely be fighting for my life. Sometimes you just need to follow your instincts, and never be afraid to back down from precarious situations. 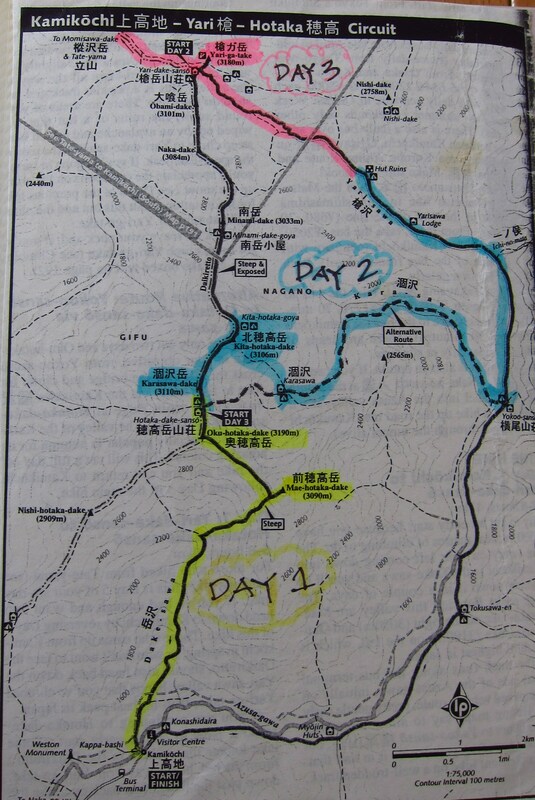 After the drama of the last 2 days, what would day 3 have in store, as I would ascend back to the ridge and up to Mt. Yari?